It's time for my very first #tooeasytuesday post. This week I wanted to make it really easy for all of you out there who might be new to paper craft and card making. Sometimes when you're starting out it's easy to get overwhelmed by all the amazing projects you can find online and in papercraft magazines. You can spend hours looking at complex projects and struggle to make something similar from the limited resources you have. Instead of embracing a new hobby, you become frustrated that your efforts maybe look amateurish and put your supplies away in a draw and go back to purchasing mass produced cards. I'm here today to tell you that doesn't need to be the case. With just one stamp and one colour you can make something beautiful. When starting a new hobby it's easier to keep in simple. You don't need to know every technique and own every product. You just need to focus on creating something simple that you love. Even if you've been crafting for years it can be a good reminder to keep things simple at times. Today I'm going to show you how easy it is to start out with just one stamp pad (Melon Mambo), one sheet of matching card, whisper white card, glue, and one stamp. supplies used: melon mambo stamp pad, melon mambo card, whisper white card, button buddies stamp set, snail adhesive, paper trimmer (not shown). If you're making your very first card keep it simple. 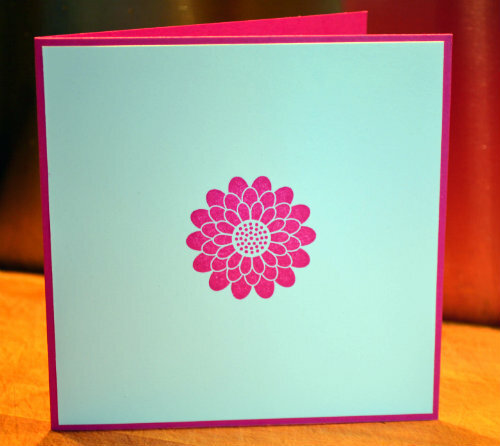 What can be easier than one crisply stamped image in the centre of a card? For this card I kept is square. The base card is 13.5cm x 27cm and folded in half. The white card is 13cm x 13cm. Want to step it up a bit? Use a single stamp and randomly cover the base white card with the same image. Stamp one image in the centre of a 5cm x 5cm square and layer it on melon mambo card (5.5cm x 5.5cm), then white card (6cm x 6cm) and melon mambo card (6.5cm x 6.5cm). Very simple to do, but surprisingly striking. Want to turn this into a birthday card? The same style would look great with a simple cupcake, present or balloon stamp. Looking for something for a wedding or valentines day? Replace the stamp with a heart. Baby shower? A rattle, teddy or other nursery themed stamp would also work well. So there you have it. 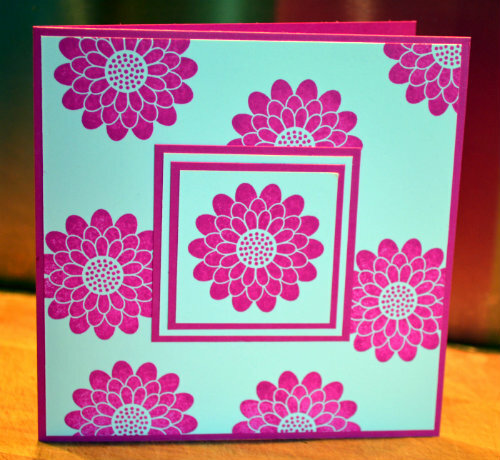 With just a few simple items - just one stamp and one colour - you can easily start a new hobby and make fantastic looking cards for friends and family.